When it comes to registering a domain name, choosing the right domain registrar is essential and it also can help you save some money. There are thousands of companies available to register a domain name, IWantMyName is also of them. In this post, I am going to share IWantMyName review which will help you decide whether it’s worth your money or not. IWantMyName is a New Zealand based company which was founded in 2008 and now operating under ideegeo Group Limited. They have more than 85000 happy customers worldwide and counting. Unlikely, most of the companies out there provide web hosting, SSL certificates, email hosting and website builder services but IWantMyName only offers domain buying. You can grab website name from the giant list of 500+ domain extensions with simple DNS management panel. Moreover, the domain managing control panel is also user friendly and comes with easy navigation which helps you perform necessary steps with a few click. But, their prices for top level domains are little bit price compare to NameCheap or GoDaddy. You have to pay $14.90 for .com and same goes to other extensions as well and Yep they are expensive. For your ease, I have divided this IWantMyName review into different sections to help you know their features and benefits. They aimed to provide a minimal and easy-to-use domain management control panel to help website owners do any necessary changes they want to implement like changing NS records or web forwarding. There is no glitch and useless options in the panel which may distract you and provide full control over your domain names. Everything on the dashboard is designed to keep in mind from beginner level user to advanced users which deliver extreme usability. 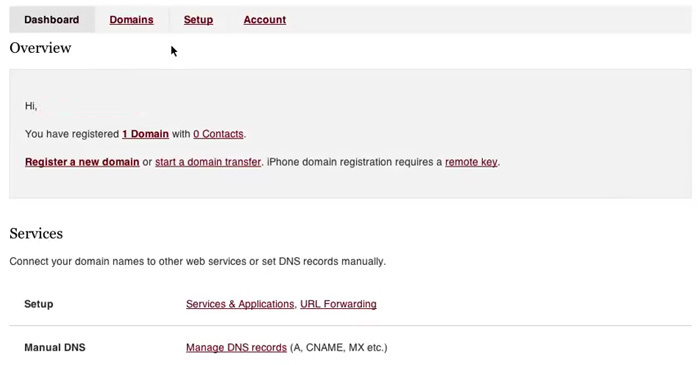 You can change the DNS settings of your domain name with a few clicks without browsing too many options. If you are someone who is looking for user-friendly registrar, then five them a try. 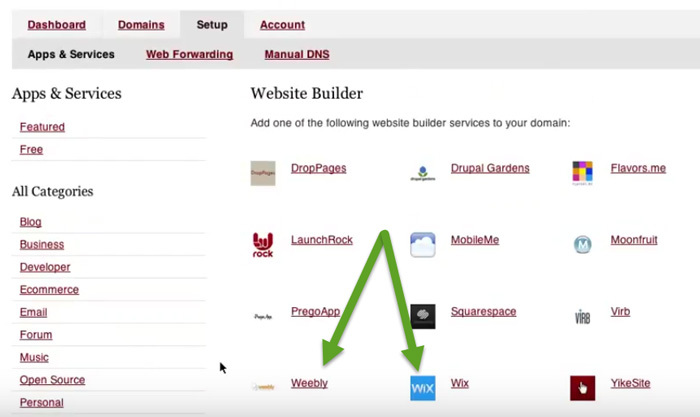 No matter if you want to use WordPress, Blogger, or any online website builder service such as WIX to manage your website, there is a pretty forward process to connect your domain name with these site builders. You can configure the domain with many online builders like Wix, Squarespace, Weebly, Drupal Gardens, Yike Site, Yola, and Virb, etc. with one click integration feature. To do this, at the dashboard, you just have to click on the option “Setup” and then “Site Builder”. Now choose the service you want to use and then click on the “Install” button. It takes roughly 10 seconds to install the required service. Isn’t easy to follow? Are you super conscious about your personal details? or don’t like to reveal your identity to everyone online? You might know whenever we register a domain name with any domain registrar they ask for personal info such as your name, email address, contact number and physical address. This information saves in the Whois database and any online user can find it using Whois checker tools. But, IWantMyName got covered you and offers Whois privacy protection feature without asking for extra fees. Yes, it’s free for every domain you register with them. Keep in mind this protection is limited to specific domains that can be below. There are many registrars who demand extra money usually $3 to $10 per year to provide this feature. Transferring domain name from one registrar to another sometimes become a hurdle and some companies make it difficult to migrate your domain to other registrars. Why? It’s simple, they don’t want to lose the customer. In worst scenarios, you might end up losing your domain. In few cases, the old registrar may ask for a higher fee to transfer your domain name or demand transfer fee which is really an ethical business practice. There are many best domain registrars available who do it for free such as IWantMyName, NameCheap, and GoDaddy. IWantMyName also offer free domain name transfer without creating any troubles for you. The process is quite simple, you just have to unlock the domain you want to transfer and provide authentication code to the new registrar. It will take few days to complete the transfer procedure. Due to ICANN policy, you cannot migrate a newly registered domain name (applied on specific domains) within 60 days. As I mentioned earlier, they don’t provide any web hosting service and mainly focus on providing domain registration service. But they have a dedicated page where the company has mentioned some recommend web hosting companies such as BlueHost and DigitalOcean. Let me introduce the little bit about these web hosts. They are one of the old and best WordPress hosting providers when it comes to start a blog or to manage a small business website. You get a Free domain name on the purchase of web hosting account. Their prices are reasonable and money conscious users can afford it easily, Bluehost review. Are you a developer or love to do techy stuff? 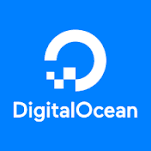 Then DigitalOcean is the great choice for you. It is also an affordable cloud hosting provider and their basic plan starts at $5/month. You can choose different OS, data center locations, data storage and create your droplet as low as $0.10/GB per month. Click for more details. IWantMyName is little bit expensive when compare to other domain registrars. You have to pay $14.90 per year for .com extension, $16.30 for .net, and $17.20 for .org TLD which is really expensive. If you plan to register 1 or 2 domains, then price doesn’t matter, but for professionals having 10+ domains, you can see a significant price difference. Same goes to .Org extension. IWantMyName charge $17.20/year whereas NameCheap offer it just at $12.48/year. 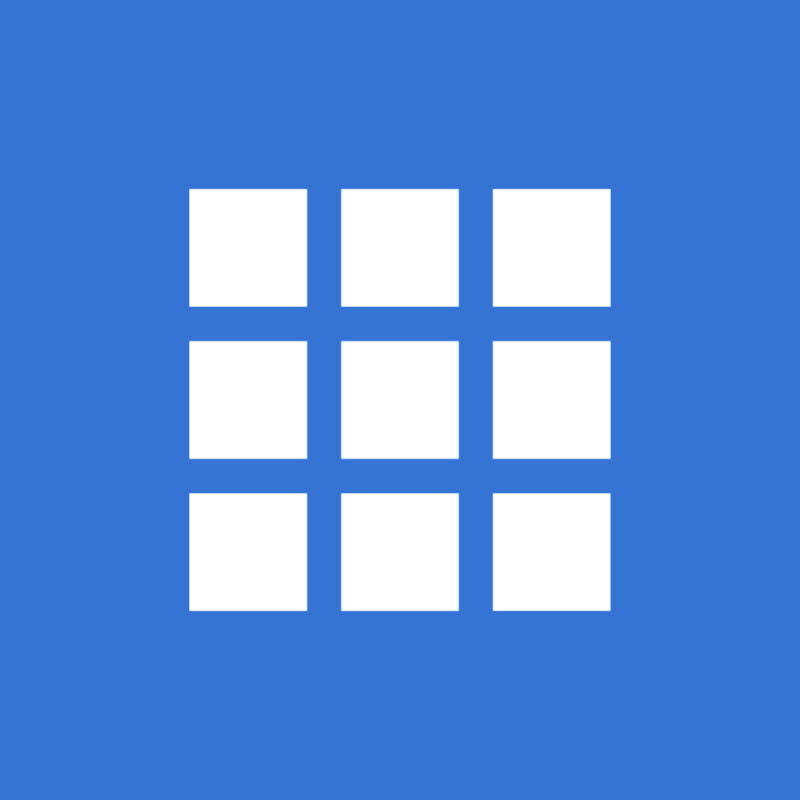 If you are managing few domains, then the price isn’t a big issue. Otherwise, IWMN will cost you more money. Here is another drawback of using IWantMyName domain registrar if we compromise on prices, they don’t have a live chat option to contact customer support. But you can get in touch with the technical staff via email within few hours. In my experience, they are really fast in this and respond within six hours. Live chat is must have feature but in IWMN case isn’t a big issue because as they just offer domain registration, so you won’t face issues regarding domains management. Right now, email support is the only option to get help. There is also a tutorials portal where you can find helpful articles for instant help. Like many other domain registrars, they also support credit cards such as Visa, Americal Express, and MasterCard to buy domains. At the time of writing this article, Paypal and Bitcoin cannot be used for processing payments. The company may add more payment methods in the future for customers ease. For PayPal users like me, it might be frustrating. Usually, I use PayPal account to buy online stuff where possible instead of providing credit cards information to any company. So, if you feel uncomfortable then here are some best domain providers you can try. I love the simplicity of their control panel and the easy navigation to perform desired actions such as changing DNS records or Name Server records modification. 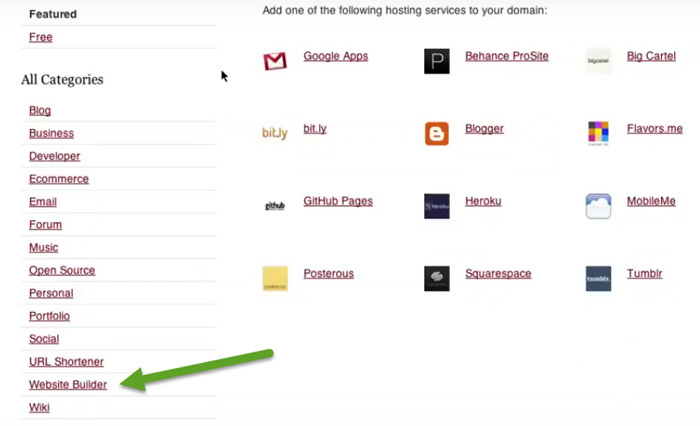 You can connect your domain name with site builder tools (Wix, Weebly) with one-click installation feature. The only thing I don't like is their higher domain prices which is biggest deal breaker. To be honest, when there are many registrars who offer domain registration at the reasonable price then why someone wants to pay more money than usual? Instead of paying higher fees, I would like to recommend Namecheap for domain names. They are cheap, affordable, trusted and well-known company when it comes to selling domain names. 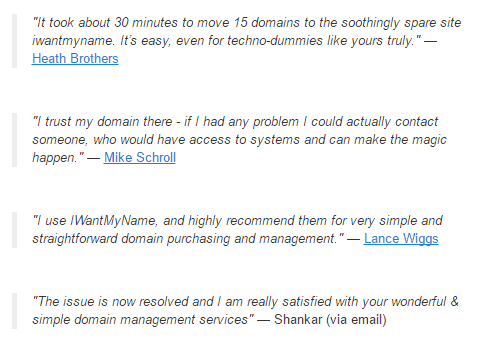 Note: If you plan to get a couple of domain names use IWantMyName without any hesitation. Otherwise, to grab or transfer dozens of domains then go with Name﻿cheap. 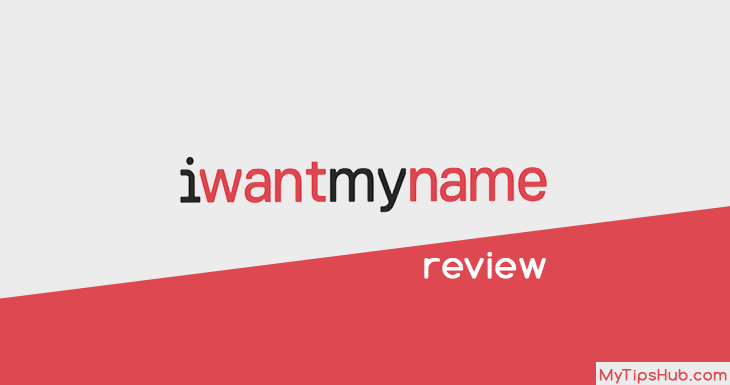 I hope this IWantMyName review will help you know their pros, cons, features, and benefits. Please do share this review with your buddies on Facebook, Twitter, and Facebook. If you're looking for easy to manage and simple domain management control panel then IWantMyName is the best fit for you. Though their prices are much higher but you get the great customer support via email.